When a former food writer decided to refresh the kitchen in her 1951 home, she turned to kitchen designer Christine Nelson for help. 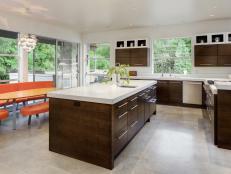 Nelson helped her client increase the counter space and overall efficiency and gave the kitchen the “colorful, updated, Midcentury Modern” look she wanted. 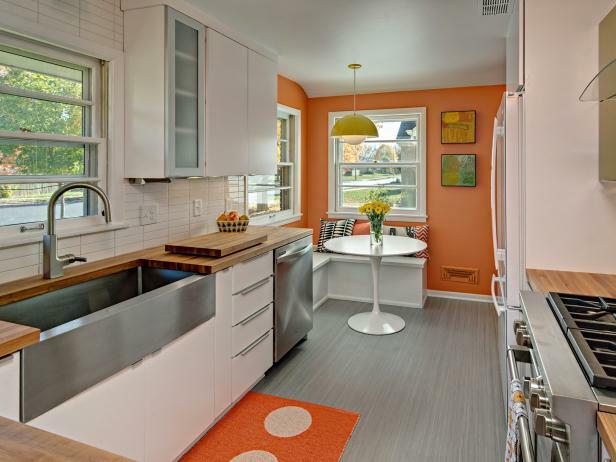 “A gray linoleum floor, stacked subway-tile backsplash, and butcher-block counters create a clean backdrop while orange walls, and avocado-green accents add a burst of Mad Men-era color,” says Nelson. Classic period furnishings like a Saarinen-style Tulip Table and a pendant light based on Werner Panton’s Flowerpot design complete the look. Although linoleum sounds like a flooring product from a bygone era, it’s enjoying popularity today as a durable, eco-friendly flooring. Modern manufacturing methods produce linoleum flooring in a huge variety of colors and styles, making it an attractive option for professional and DIY designers. Linoleum is a resilient flooring material, meaning that it compresses and yet bounces back when walked on, giving it a slight cushioning effect. 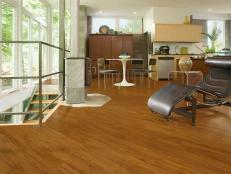 Vinyl and cork are other types of resilient floorings. 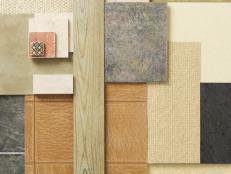 Linoleum comes in glue-down sheets and snap-together tiles. It’s made from all natural, renewable materials including linseed oil, cork powder (which gives linoleum its bounce and resilience), pine resins and wood flour. 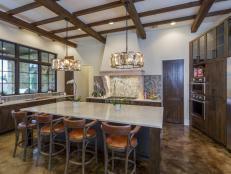 Limestone dust may be added for hardness and durability. Pigment dyes give linoleum flooring various colors and patterns that range from subtle to vividly expressive. Some manufacturers add a protective coating to their linoleum that helps protect the flooring from scratches and fading from exposure to sunlight. 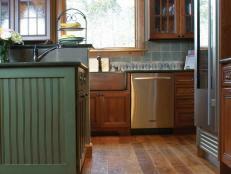 Without a coating, linoleum should be cleaned and waxed every two or three years to maintain its luster. Although it’s often confused with vinyl flooring, sheet-type linoleum is a much stiffer material than sheet vinyl, which can make installation a challenge. 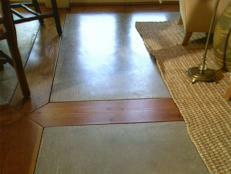 DIYers may be better off opting for snap-together tiles that are designed as part of a floating floor system. 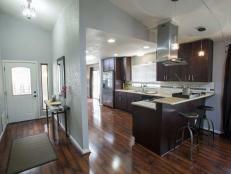 Linoleum costs about the same as vinyl: $2 to $5 per square foot, installed. It’s very durable, with warranties that range up to 25 years. With proper care, a linoleum floor can last 40 years or more. 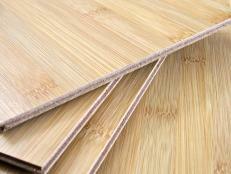 In addition to being made with renewable materials, linoleum is biodegradable and won’t take up space in landfills. Linoleum does not emit harmful VOCs (brand new linoleum does have a harmless odor from the linseed oil content that dissipates after a few weeks). Linoleum flooring maintains it’s good looks because the pigments are throughout the thickness of the material, not just on the surface like vinyl and laminate floorings. That helps camouflage scratches and dings. 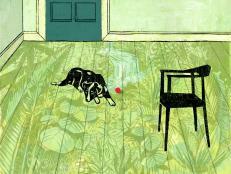 Linoleum requires little maintenance, needing only occasional sweeping and damp mopping. Resilient linoleum can get dented by high heels and furniture legs. Sharp objects may cut the materials. Linoleum may darken or turn yellowish when exposed to sunlight, a process called “ambering.” Linoleum with a factory-applied protective coating helps prevent ambering. Linoleum can be susceptible to moisture and isn’t recommended for installation in bathrooms, laundry rooms or other areas that may have spills, splashes and high humidity. Below-grade basements should be dry and free of any history of leaks or water damage. New and freshly waxed linoleum flooring can be slippery. 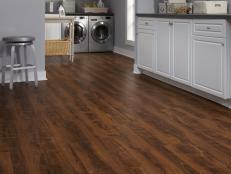 Laminate flooring is DIY-friendly, durable and versatile, but is it right for you?